Lacquerized — A blog about nail polish: How to: Rescue a nail! How to: Rescue a nail! Oh shoot. Cracked a nail? Don't give up on it immediately! After a lot of stamping with the feet and cussing around, I usually just rip off the cracked tip. And yes, this usually makes me very sad. But no more sadness for me, because a while ago I discovered these neat little things called silk wraps. A silk wrap is a synthetic nail reinforcement that is made from pieces of silk material. There are wraps made out of linnen and fiberglass too. If you don't have silk wraps lying around, you can use a tea bag as well! You can also use silk wraps if you just happen to have weak nails or if you have cracked an artificial nail. And no one will notice them! I like to use the Essence SOS Nail Repair Pads, one package contains 10 self adhesive pads. You can use every brand you like, these were easy to get for me. I think these aren't the strongest, but they do look mighty natural. Self adhesive is the way to go, it makes everything so much easier. 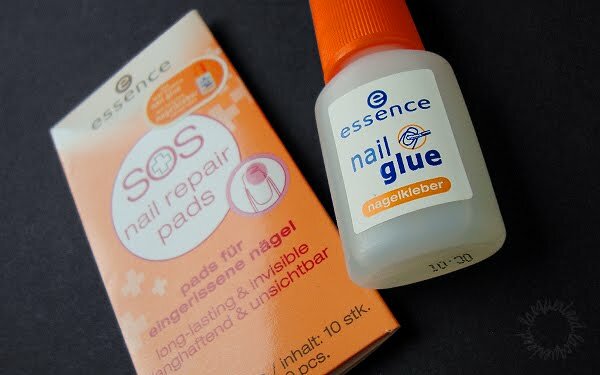 I also use the Essence brush on nail glue. The brush makes it also easier, you definitely don't want to frustrate yourself using something with a teeny tiny spout. I'd suggest cutting the silk wrap into the right size before starting anything. So far I haven't used these on myself, but I think I've applied them about seven times on my mom's nails. At first I was really struggling with it, but after a while I got the hang of it. 1. Start off with a clean and nail polish free nail. Disinfect it with alcohol and roughen it up a little with a file. 2. Apply a little bit of glue on the crack. You can use an orange stick to keep everything in place while it's drying. 3. Place your fitted silkwrap on your nail by using tweezers. Leave a tiny gap, so you won't glue down your cuticles. Use the orange stick to push the entire thing down on your nail. 4. Apply one coat of glue on top of the silk wrap. Let it dry completely before going to the next step. 5. Apply one more coat of glue. When it's completely dry, use a buffer file, on the glue only, to smoothen everything out. Also file down any pieces of silk wrap that might stick out at the tip. See? This wasn't that hard, and it's hardly noticeable! If the tear is pretty severe you might want to place a second silk wrap, to make it even stronger. Depending on how many times you paint your nails these can last a pretty good time, let's say a couple of weeks. I know my mom is wearing a silk wrap that is already lasting four weeks! There is one thing though, you cannot use nail polish remover that contains acetone, because acetone will dissolve the glue. If you want to get rid of the silk wrap, simply soak your nail in acetone for a few minutes and the silk wrap will come off just like that.